Darwin Australia is a great tropical city. The capital of Northern Territory is a multicultural city famous for its huge thunderstorms, beautiful sunsets, colourful Mindil Beach Markets and excellent barramundi fishing. 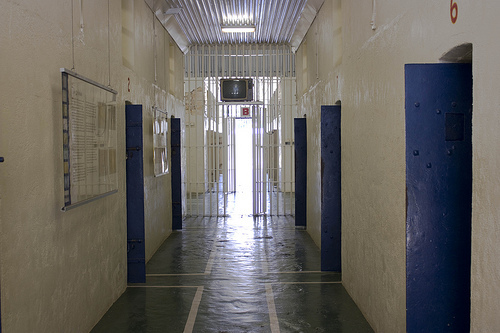 Places to see include the Northern Territory Parliament House, Fannie Bay Gaol Museum, Darwin Entertainment Centre and Botanic Gardens. 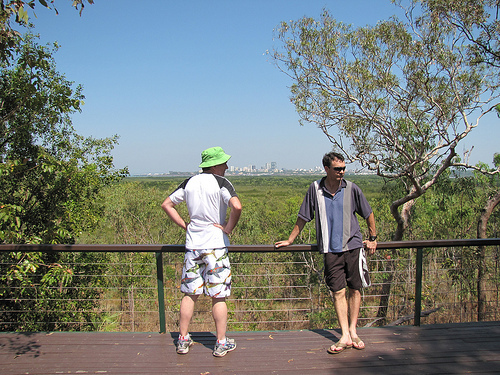 Outside are Charles Darwin National Park, Crocodylus Park, Territory Wildlife Park and Berry Springs Nature Park. 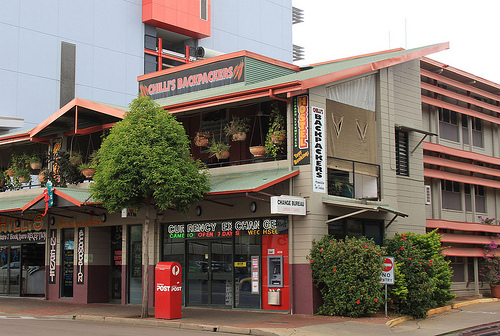 Central Darwin is a compact area between Cavenagh Street in the north and the Esplanade in the south. The main shopping area is around the pedestrian Smith Street Mall, east of which is the harbour and Stokes Hill Wharf, and south of which is Mitchell Street. South of the Smith Street Mall are the Old Court House and Northern Territory Parliament House. 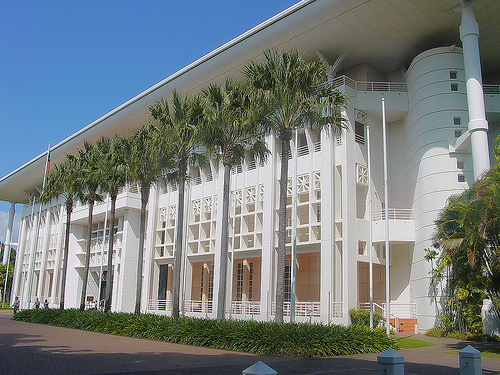 The Northern Territory Parliament House (in the southern end of Mitchell Street) also houses the state library; and there are free guided tours in Saturday mornings. A little south of the Parliament House are the Government House and the old Deckchair Cinema where you can watch movies under the stars – there is also a licensed bar and you can buy snacks and light meals. East from here is the Darwin Wharf Precinct, Stokes Hill and below the cliffs the Stokes Hill Wharf, popular with sunset dining in the end of the wharf, outside an old warehouse called the Arcade. 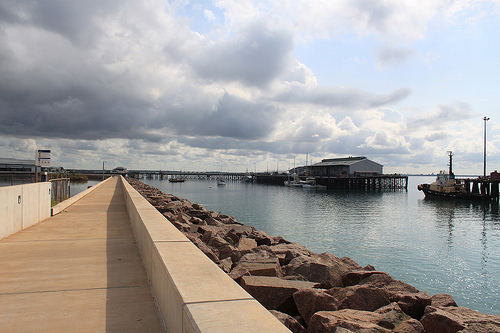 In the Darwin Wharf Precinct there are oil-storage tunnels which you can visit, built during the WWII. Near Stokes Hill is Indo-Pacific Marine - a marine aquarium where you can get close to the Top End’s marine life, such as box jellyfish, stonefish and other amazing creatures. Near the Indo-Pacific Marine is the Australian Pearling Exhibition with displays of the history of pearling, which has been practiced in the area. 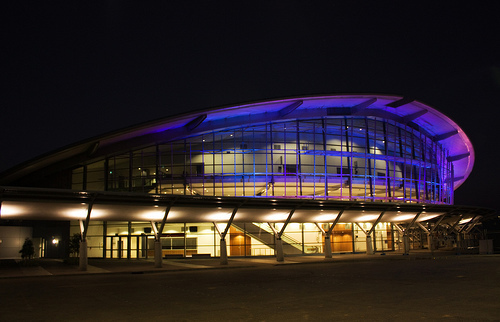 South of the city centre is the Esplanade with Aquascene, Darwin Entertainment Centre and Bicentennial Park, popular with walkers and roller skaters. Aquascene is the place for the famous fish feedings where hundreds of fish come to the shore every day to be hand-fed at the high tide. Aquascene only opens when the fish arrives, so the opening hours depend on the tides and vary each day. Read more about Darwin fishing life (link coming soon). On the western side of the peninsula is Cullen Bay with speciality shops and waterfront restaurants, and north of it is Mindil Beach, famous for its markets. Cullen Bay is a lovely place to watch the sunset over a drink or have a dinner. 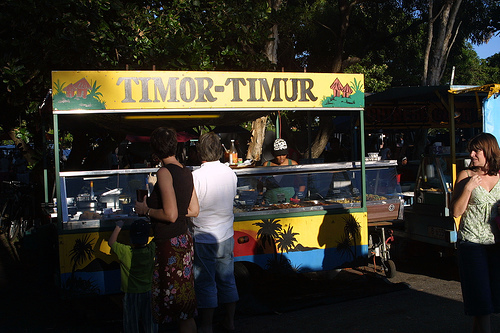 Mindil Beach Markets, held on Thursday evenings and Sunday afternoons between April and October, is one of Australia’s most famous markets. 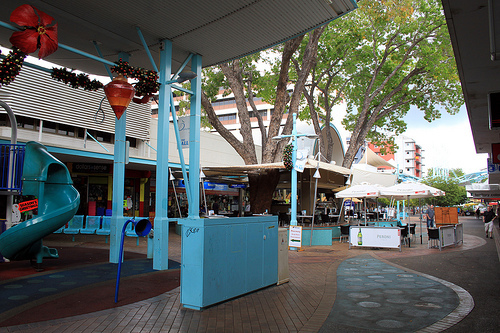 It is a cosmopolitan market with local produce as well as goods from Pacific Islands and south-east Asia, complete with food stalls and street performers – if you are in Darwin during the Dry Season, don’t miss it. 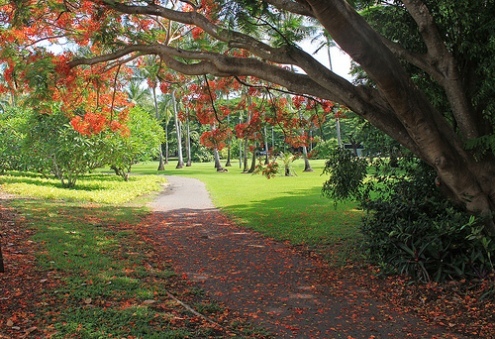 Across the Gilruth Avenue from the Mindil Beach is the area called The Gardens, which includes sports ovals, a Gardens Cemetery and the 42–hectares Darwin Botanic Gardens – a good place to have a picnic or learn about the flora of northern Australia and other tropical areas around the world. 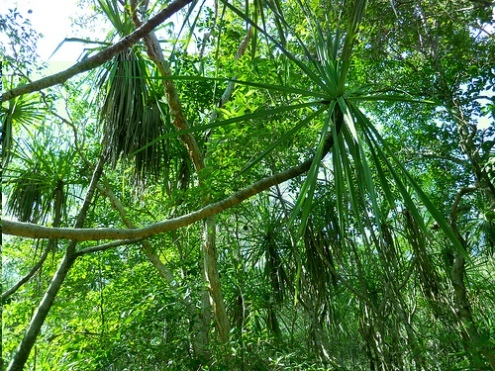 There are orchids, tropical rainforests and over 400 palm species and a self-guided Aboriginal plant-use walk. North of Mindil Beach and the Botanic Gardens is Fannie Bay with Ross Smith Memorial and Fannie Bay Gaol Museum. The Fannie Bay Gaol Museum which was in use between 1883 and 1979 is an interesting place, there are even gallows made for a hanging in 1952. 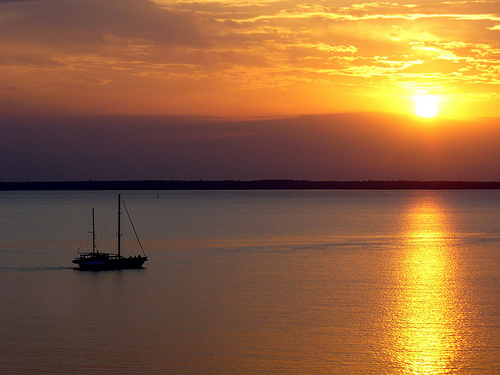 South of here are the Darwin Trailer Boat Club and Darwin Sailing Club – nice places for a sunset drink or a dinner with views over the ocean. Also in Fannie Bay is the Museum and Art Gallery of Northern Territory - an interesting museum with displays of the area’s history, natural sciences, culture and art. The Northern Territory Aboriginal Art collection is great with paintings from Arnhem Land and Tiwi Islands, and there are also arts and crafts from other Pacific regions and south-east Asia. But the two best things are the Cyclone Tracy exhibit, and Sweetheart – a 5m stuffed saltwater crocodile that was killed after it had been attacking fishing boats outside Darwin. North of Fannie Bay is East Point - a beautiful peninsula with some nice lookouts, walking and cycling paths, and year-around swimming in Lake Alexander. East Point was an important base of defence of Darwin in the Second World War, and on the northern side of the peninsula are some wartime gun emplacements in a 200-hectare reserve, and the Military Museum - an interesting place to learn how badly the city was hit by the Japanese in the WWII. East Point is also a great place to see wild wallabies hop around in the early mornings and late afternoons. South of the city is the coastal Charles Darwin National Park, which protects some extensive mangrove habitats between the mouths of Sadgroves and Reichardt rivers. The park is a nice place for a picnic with views over the city skyline. East of the city, on the crossroad of McMillans Road and Vanderlin Drive is the Crocodylus Park where you can get close to crocodiles. You can take the 45-min tour or just watch them being fed – there is also a small zoo park and a souvenir shop. Another place to watch crocodiles is the Darwin Crocodile Farm south-east of the city off Arnhem Hwy. There are some beasts here – the most famous one is the 5.2m Bert – the Crocodile Dundee movie star. Like at the Crocodylus Park, you can either just walk between the lagoons on your own or attend daily tours and watch crocodile feedings. 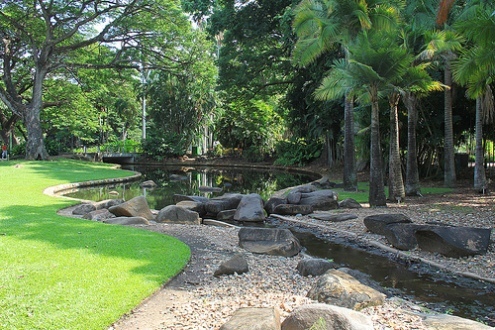 Near the Darwin Crocodile Farm south-east of the city are also the Territory Wildlife Park and Berry Springs Nature Park. Berry Springs Nature Park that protects parts of Berry Creek catchment has some good swimming, picnic tables and a kiosk that sells snacks and refreshments. At the Territory Wildlife Park there are walks through wetlands, woodlands and monsoon and vine forests where you can see Australian animals in their natural habitats and there is also an aquarium, a nocturnal house and aviaries with lots of birds. 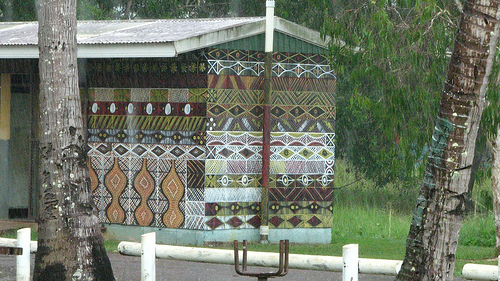 Just north of the coast are Tiwi Islands – Melville and Bathurst. They are beautiful islands with some nice beaches and lush rainforest, but the most interesting thing about them is the Tiwi culture that you can learn from the local Tiwi People who have been living here for thousands of years. The islands have been fairly isolated and many of these people still follow a traditional lifestyle. They are also great artists and you can visit an art gallery on Bathurst Island. 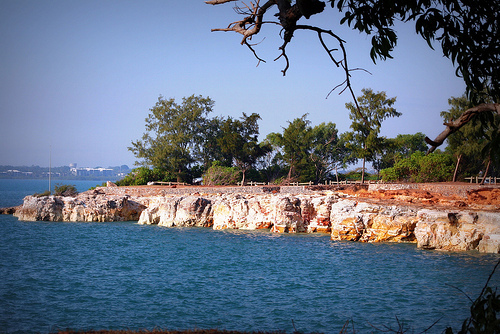 You need a permit to visit and the easiest way is to take a day tour from Darwin by Tiwi Tours. Other tours that you can take include afternoon Darwin sightseeing tour, and the famous jumping crocodile cruise on Adelaide River. Apartments and upmarket hotels: Alatai Holiday Apartments, Aralia Beachside Apartments, Argus Apartments, Botanic Gardens Apartments, City Gardens Apartments, Coconut Grove Holiday Apartments, Crowne Plaza, Cullen Bay Serviced Apartments, Darwin Central Hotel, Harriett Place Apartments, Luma Luma Holiday Apartments, Mantra on the Esplanade, Mantra Pandanas, Marina View Apartments, Marrakai Luxury Suites, Medina Grand Waterfront, Mediterranian All Suite Hotel, Nightcliffe Beachside Apartments, Novotel Atrium, Parap Village Apartments, Peninsular Apartments, Quality Hotel Frontier, Quest Darwin, Quest Parap Apartments, Rydges Airport Hotel, Seven Spirit Bay Hotel, Vibe Hotel Waterfront and Wharf Escape. Motels, lodges and backpackers: Ashton Lodge, Asti Motel, Banyan View Lodge, Barramundi Lodge, Best Western Airport Gateway Motel, Casa on Gregory, Chilli's Backpackers, Comfort Inn Vitina, Darwin YHA, Feathers Sanctuary, Hi Way Inn Motel, Holiday Inn, Holiday Inn Esplanade, Melaleuca on Mitchell, Palms Motel, Paravista Motel, Poinciana Inn, Value Inn, and Youth Shack. 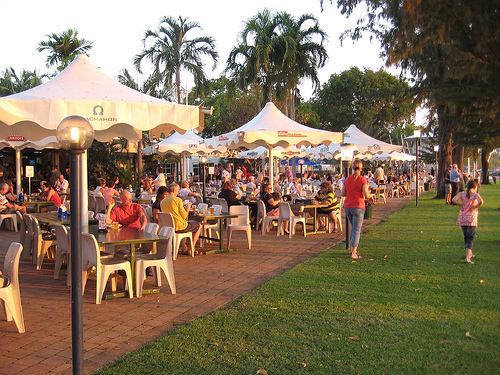 Like in most of Australian cities, there are lots of festivals happening in Darwin. In May there is the Down Under International Film Festival; in July there are the Beer Can Regatta and Darwin Fringe Festival, and in August there are the Darwin Rodeo, Darwin Festival and the National Aboriginal & Torres Straight Islander Art Awards.